Do you want to stand up as a Californian against oil industry abuse? Join a non-violent direct action in Sacramento to insist that industry ally Governor Jerry Brown ban fracking and neighborhood drilling to protect our communities. Californians have delivered well over one million petitions to Governor Brown calling on him to stand up to the oil industry, and held many rallies and press conferences. Health forums have explained the toxic effects of extreme oil and neighborhood drilling. Brown has received consistent reminders that the majority of Californians and the science DO NOT support fracking and neighborhood drilling. Brown has never acknowledged these demands. Instead, he has cultivated close ties to Big Oil, taken money from industry, and cut oil industry-friendly deals around critical policies and regulations, while people continue to be exposed to known carcinogens in their own homes and drilling expands. Governor Jerry Brown wants to be remembered as a climate leader, but the reality is that he has already failed the test of real leadership. On August 20th Californians will travel to Sacramento to take non-violent direct action to declare a day of reckoning and demand that Governor Brown stand up to Big Oil. 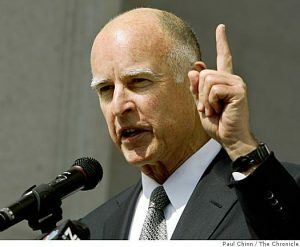 They will insist that Brown stop issuing new permits for oil drilling in California and commit our state to a managed decline of fossil fuel production, beginning with 2,500 foot setback limits to protect frontline communities from toxic oil and gas drilling as part of a just and equitable transition away from fossil fuels. Once you’ve registered, you’ll be emailed by the organizers with more information. OFFER a ride or REQUEST a ride to Sacramento on Monday here.